You Got It! Glass tile back splash Woodstock/Milton, GA.
A glass back splash is the epitome of modern design. It’s easy to clean, looks sharp and will get you your best ROI after a sale. It comes at an added expense because of the technical nature of the install. We silicone caulk the entire perimeter of the splash creating a soft joint for movement, sand all edges, we are wary of blown out paper backing, and we polish it to shine when finishing up! An experts touch! 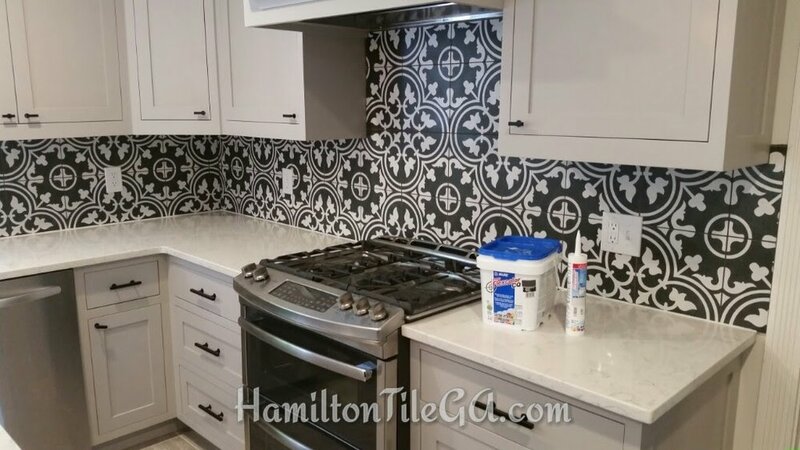 Hamilton Tile is your go to for back splash installations. 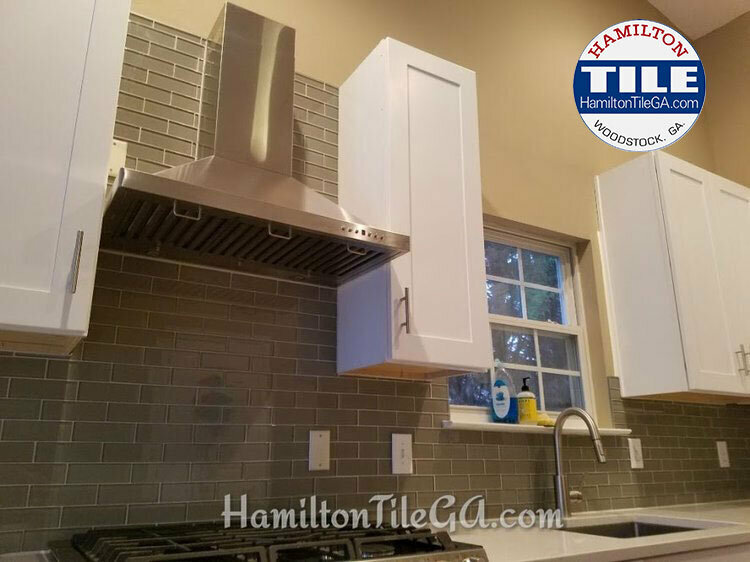 Spectacular taste from these folks located in Milton, GA. Click here to learn how the positioning of your under cabinet lighting can make or break the over all look of your back splash. A beautiful natural stone, Herring bone back splash in Roswell, GA. We’ve all seen the cracked grout between the counter top and back splash. We solve that by using 100% silicone caulking at all plane changes instead of grouting it in tight, which will eventually CRACK! Click here to learn more. The regular growth of our portfolio is a sign that we are a business that values conscientious, consistent and customer focused service. This is a bit of artisan tile work done in East Cobb, GA for a design oriented homeowner. 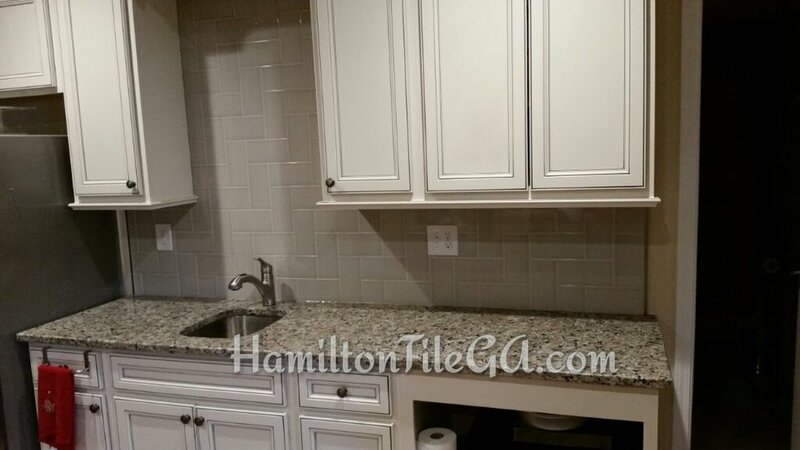 Hamilton Tile has you feeling secure by covering your counter tops, covering your floors and doing a thorough clean up. Not to mention going above and beyond, installing you a one of a kind back splash in your home. Be the talk of the neighborhood with a professionally installed glass back splash. What's not to like about this back splash in Woodstock, GA. Truly accentuates the décor in this area. A superb merola tile back splash in Roswell, GA . An upgraded splash with Mapei's FlexColor single component grout, stain free and waterproof, w/ Mapesil full silicone caulking. Ardex X5 thin set with Merolatile Demand the competition provide you with quality installation products! A before and after collage with Jason hard at work and Ben on photography detail! Does that Ben guy ever WORK? 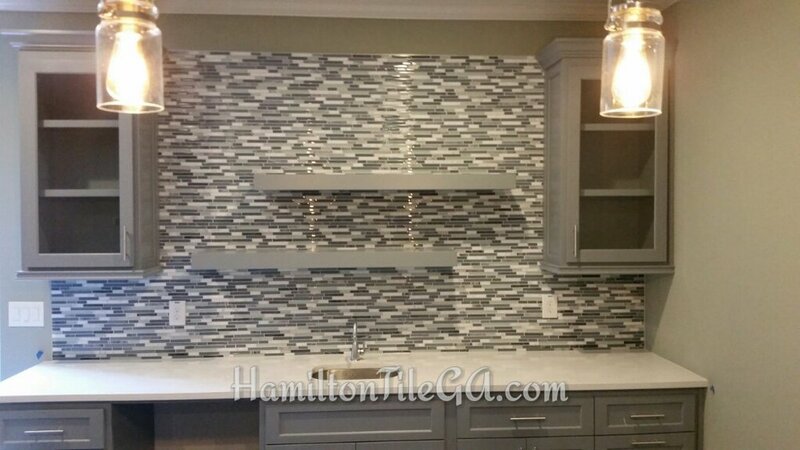 Another back splash in Woodstock, GA.
Stacy's backsplash finished 11/15/16 in Marietta. Mapei full silicone caulking with glass inset into natural stone. A 100lb piece of granite set into the wall behind this stove. Quite a project, and Kerdi board was expertly utilized once again. A backsplash for LPK Construction. We are upgrading backsplashes all over the Atlanta area by using dust free, water proof Kerdi board instead of antiquated cement board and sheet rock. We did the stonework, backsplash, and accent wall in the basement seen here. 2/16. Will the competition protect your property during an installation and leave your home better than when they arrived? A true finish guy lives by the creed "Would I pay for this?" If you like the centerpiece and you are interested in a removable splash, please go to Kitchenpallette.com. They have many themed splashes. Yes, you can remove this backsplash and change the whole theme of your kitchen! Look at this video explanation of this outstanding option for your kitchen! 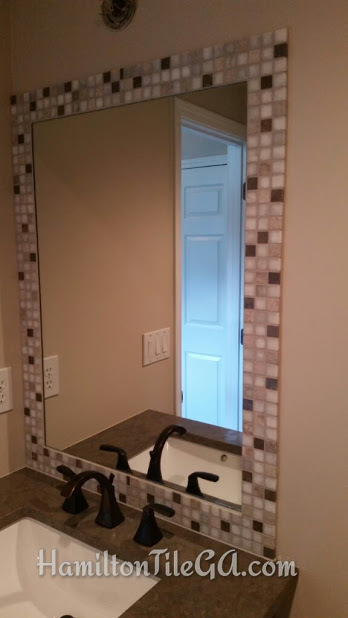 A very unique backsplash by referral from the electrician. These brick walls are all the rage and add an incredible visual touch to your indoor space. We are ready to put one in for you!